The goal of IMRT is to increase the radiation dose to the areas that need it and reduce radiation exposure to specific sensitive areas of surrounding normal tissue. And thus with advances in radiation therapy IGRT became a companion for IMRT. IGRT is an advanced method for accurately guiding the IMRT to the target area. In IGRT, repeated imaging scans (CT, MRI, or PET) are performed during treatment. 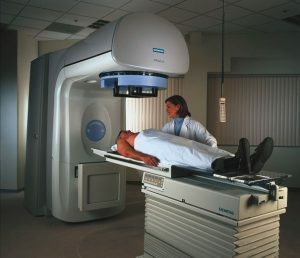 These scans are processed by computers to identify changes in a tumor’s size and location due to treatment and to allow the position of the patient or the planned radiation dose to be adjusted during treatment as needed. Repeated imaging can increase the accuracy of radiation treatment and may allow reductions in the planned volume of tissue to be treated, thereby decreasing the total radiation dose to normal tissue.